Blair's (NEW) Ultra Death Hot Sauce, 5oz. High River Sauces Foo Foo Mama Choo Hot Sauce, 5.4oz. Predator Great White Shark Hot Sauce, 5oz. 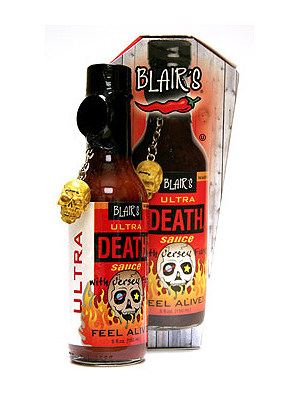 Blair's Ultra Death Sauce (5oz./150ml) Suggested uses: Be warned: this sauce contains ingredients 800 times hotter than a jalapeno chile. Use sparingly. Ultra Death should not be consumed without dilution. Ingredients: Red Habanero Pods, Naga Jolokia, Cayenne Chiles, White Vinegar, Natural Pepper Flavor (contains soybean oil), Tomato Puree, Pirri-Pirri Chiles, Lime Juice, Salt, Spices. Mad Dog 357 Ghost Pepper Hot Sauce, 5oz.